A 6-year-old girl met with the Newark firefighters who rescued her from her family's burning home. Erica Byfield reports. 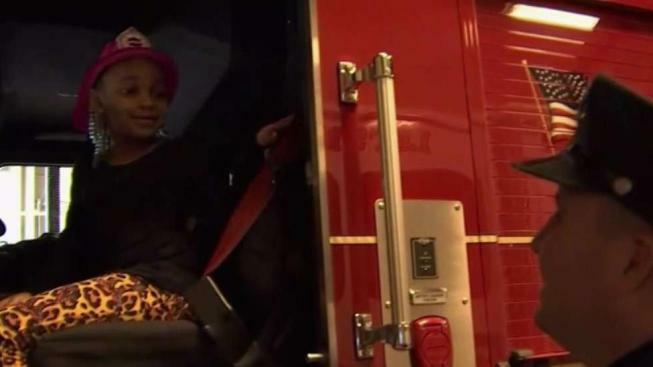 A 6-year-old girl who was pulled to safety from her family’s burning home got a chance to meet with the firefighters who rescued her. Firefighters raced to South 12th Street in Newark on Saturday, where flames and thick smoke had engulfed three homes. Everyone had escaped the homes except Raeign Williams, 6, and her mom. “There was fire in my room. There was fire in the kitchen,” Raeign recalled. The only room that wasn’t filled with smoke was her mom’s room, she said. A police officer managed to walk Raiegn’s mom out of the home, but her mom yelled that her daughter was still inside the home. Firefighters found Raiegn on the third floor not long after. “All we saw was this little hand, in the air, and she was waving, ‘I’m here, I’m here,’” he said. By the time they’d reached Raiegn, it had become too dangerous to take the stairs, so firefighters stayed put and wrapped Raiegn in a blanket before radioing for a ladder. One firefighter gave the girl his oxygen mask and reassured her. Once the ladder was in place, firefighter Ryan Rosetti carried her down. “On the way down, she thanked me… two times,” Rosetti recalled. Chief Rufus Jackson said he was proud of the firefighters who carried out the rescue. “It’s a great day for the Newark fire service,” he said. The cause of the fire is still under investigation. Raiegn kept a brave face throughout the rescue — despite the fact that flames had engulfed her home.